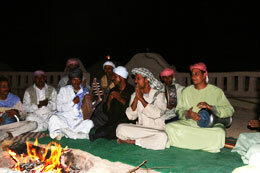 Come to the Oasis Dakhla and meet real bedouins living still close to their old traditions and way of life. We will try to give you an impression how it is to live as a bedouin and what it is, that makes us bedouins. 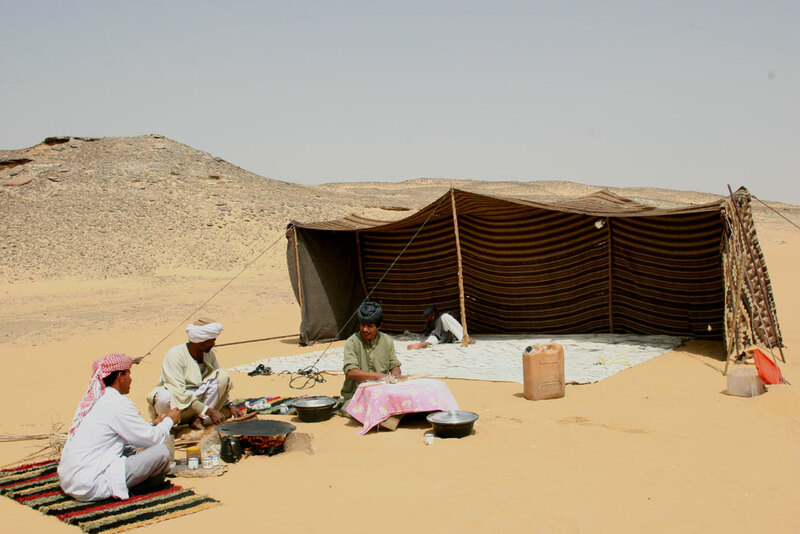 The traditional bedouin tent was woven from goats' hair. When it rains the weave contracts and doesn't let the water in. In the heat of the summer the outside of the tent feels very hot to the touch while the inside remains blissfully cool. 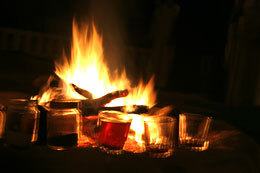 In the winter when it is cold outside with a small fire inside the reverse is true, and the tent stays warm and cosy. Nowadays the tents are used so often and are moved day by day that we changed the material and style to be more propper for our guests. But they still offer the bedouin comfort and atmosphere. They protect us in the night from the wind and let us sit together inside to make music. We don't need anything else but our voices and the clap of our hands. These songs make us feel strong in the desert and the loneliness disappears. Our grandfathers teached us many kinds of songs about their lovers. There are also lots of songs for the camels, to make them happy and strong. 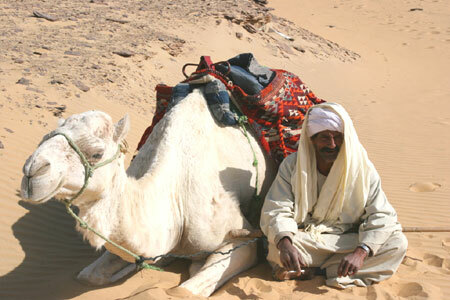 You will never understand this feeling, only if you sit in the saddle of a camel and your body moves on the camel. We are singing these songs now with our guests at our fire place in the camp and outside on our safaris. We love to play the drums and the samsomeja (similar to a western guitar) and we feel so happy to keep our traditions alive. Because it was so difficult to carry all the fresh fruits and vegetables with us in the desert our food was so simple and more tasty. Rice and flour was easier to carry. Maybe this is the reason why we have a variety of bread, which was made freshly every day. The classical fetir was made with flour, water and little salt in the fire. It was used to put it in the soup or hot milk in the morning. 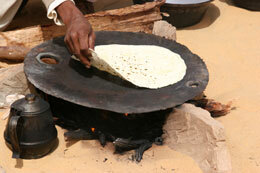 Moraras, like a pancake, are made from flour, water and samna (a kind of fat) and sugar or honey. In our hotel you will get every morning a fresh and special home made fetir with oil. Our meals are mostly made of rice and vegetables in a tasty sauce, simple and healthy. A guest is always welcome to the bedouin home. We feel our houses are like a poor home without guests. All the big family will come to share the food with the guests who came to one of the houses in the village. And after the meal the men will discuss between each other, where the guests will eat next. So the guests will feel all the warmth of our houses. Even if you just pass by we will be happy to drink a tea with you. And because a guest comes from god, so called Dayf Allah, he will never pay for anything he needs. All the cost will be a pleasure for us to pay. And also in our camp you will see our smiles in our faces for having new guests and when we sit around the fire we will invite you for a tea with fresh mint so you feel our warm hearts for you, our guests. Just come and see how we look alike today. We love to wear our galabeya, the long dress, in all different colours and shaals to protect our head from the sun or the cold wind. There are a lot of different styles how to wear the shaals and lot of different colours. And especially almost all the male members of the Zeydan family hide their own desert on their head with the shaal.